The textile industry is one of the leading beneficiaries of energy derived from steam where it is used in various processes, most notably for dyeing. Steam generates heat which is then used to power production processes in the manufacture of textiles. 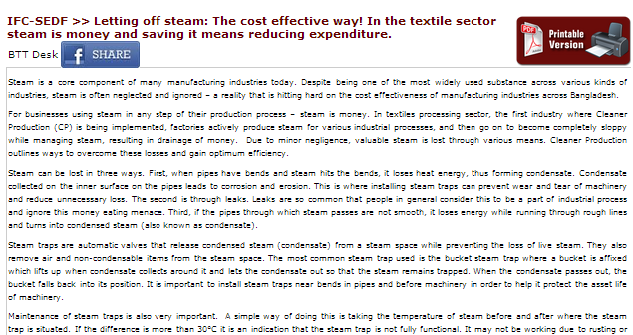 As noted in an article by Textiletoday.com.bd, however, a defective steam generator can result in wastage that leads to higher production costs and production inefficiency. Steam can be lost in three ways. First, when pipes have bends and steam hits the bends, it loses heat energy, thus forming condensate. Condensate collected on the inner surface on the pipes leads to corrosion and erosion. This is where installing steam traps can prevent wear and tear of machinery and reduce unnecessary loss. The second is through leaks. Leaks are so common that people in general consider this to be a part of industrial process and ignore this money eating menace. Third, if the pipes through which steam passes are not smooth, it loses energy while running through rough lines and turns into condensed steam (also known as condensate). As the article describes, a broken steam trap can lead to the collection of condensate and result in leaks, which will prevent heat generation optimization. When this happens, more energy is needed to get the right amount of heat, resulting in higher power costs. Reliable Armstrong steam traps can be found among various companies such as ALB Industrial Supplies, Inc., but be sure that what you’re buying is genuine to avoid leaks and further damage; only trust suppliers who have made name for providing customers with great service and authentic parts. Proper maintenance and recycling condensation into boiler water can save you a lot of money. It can also prevent other problems such as corrosion and rusting. Choosing a durable Armstrong steam trap can address all these issues, as this brand has had a long history of producing quality products and because its parts are resistant to damage, you can expect that you will not have to get a replacement anytime soon. If you’re running a textile company or just a small homegrown cloth store, don’t neglect your generators so that you can run your business at peak efficiency.